The Marysville School District is seeking parents and guardians to participate in a discussion group about early learning math. The family dinner night and discussion groups are scheduled on Thursday, November 15, at 5:30 pm, at the Marysville School District Early Learning Center. Dinner and childcare provided. 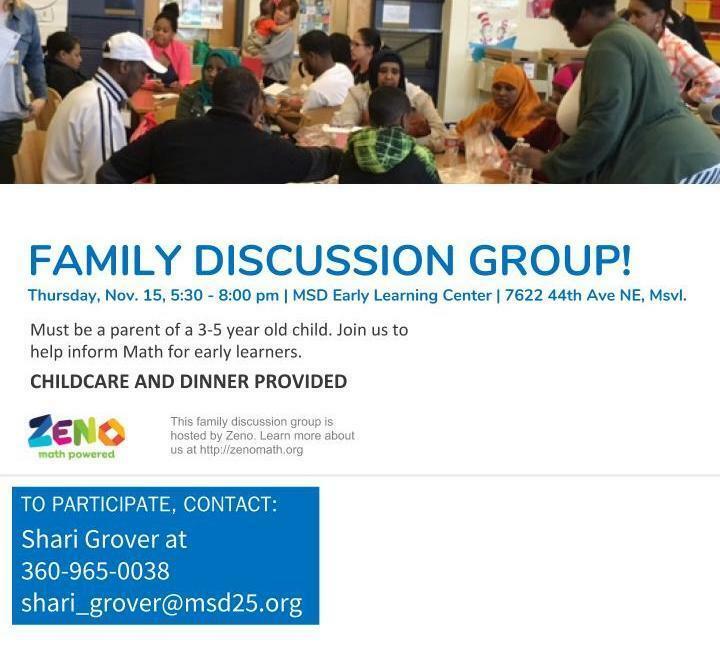 Working with a non-profit group called Zeno Math, discussion will be held around improving math concepts for early learnings. What is learned in the discussions with our early learning families will be used to create fun family math nights in the spring where all participating families will receive a free math game. Learning math concepts at an early age is an important step in your child's academic growth and development - this program makes learning math fun. We hope you will join us for this informative night. To reserve your space, contact the staff listed below. For more information, contact Shari Grover (English), 360-965-0038 or Cassandra Perez (Espanol), 360-965-0001.